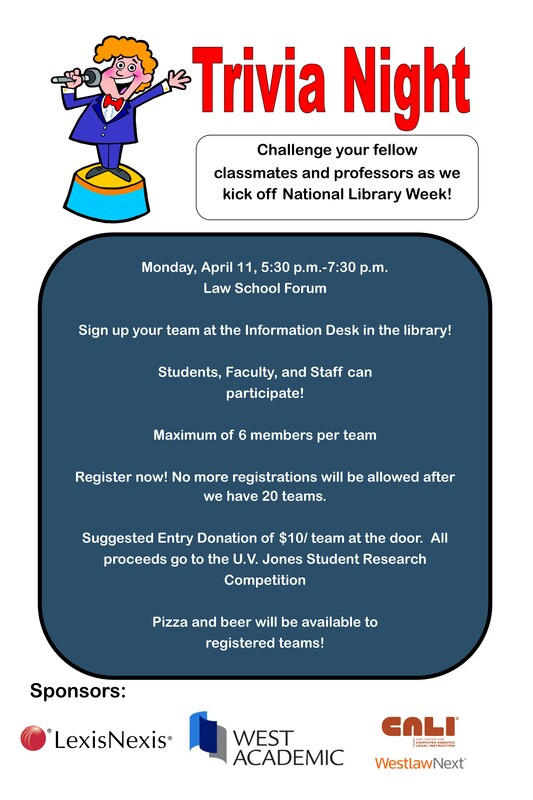 Join the law library to celebrate National Library Week on Monday, April 11th at Trivia Night. It’ll take place in the forum from 5:30-7:30pm. Come take on your professors and classmates! Register now, as we will cap registration at 20 teams. Teams must be made of 6 people or less. Pick up your registration sheet at the Library Information Desk. If you’re an individual who is interested in participating, but don’t have a team, you can still register! We will be putting together a “free agent” team for all of these individuals. Players on registered teams will enjoy pizza and beer at Trivia Night. The top three teams will also win great prizes, including movie tickets! If you have questions, email Alyson Drake, the Student Services Librarian, at alyson.drake@ttu.edu, or stop by her office in the library (126ba). And, keep an eye out for announcements regarding the many other awesome events that will be taking place during National Library Week!